In the world of online real estate, Social Proof is the first thing that prospective online clients are going to look for before doing business with you... And in many cases, Social Proof is what gets them to take an interest in the first place! It's way more than that! Social proof describes a phenomenon whereby people look to others for reference, and even flat out copy their behavior in a given situation. More broadly speaking, if someone is considering selecting you for their real estate needs, they want to see proof that you're going to do a great job for them. It's called social proof, because they want to see this proof demonstrated within a social (human-to-human) context. Recent studies have shown that 91% of people read reviews, and 84% of people trust reviews just as much as friends. In other words, your clients will value social proof on your website almost as much as a recommendation from a friend. Ratings & Reviews: So this would include sources like Zillow Reviews, Google Ratings, Facebook Recommendations (formerly reviews), and Yelp. Provable Results: This includes sold properties, how much experience you have, how many transactions you've closed, etc. Social Media: Are you active on your social networks? Are people talking about you there? Hyperlocal & Authority Type Content: This would include real estate education blogs, market updates, hyperlocal area pages, interviews, podcasts — anything that demonstrates you as an expert, while also (ideally) providing value. So how does this all translate into your real estate website and broader online marketing efforts? While word of mouth can get some great results for agents, it’s hardly a good choice for the digital world we live in today. Luckily, you can easily leverage social proof on your website to make an impact. If you have a 'list with me/us' page, make sure to feature your 'sold properties' to create additional social proof. Social proof should be one of the prime areas to focus on when building your real estate website. 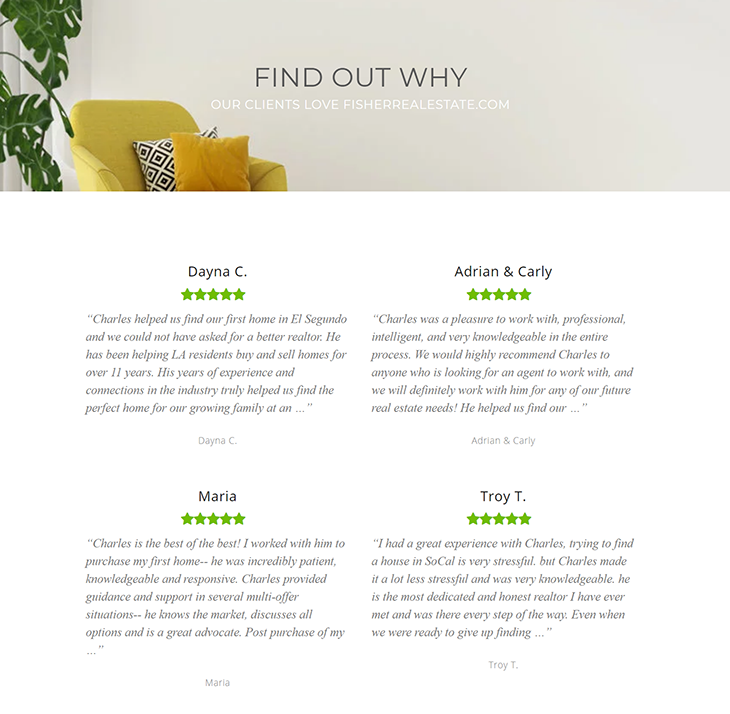 Instead of relying on promises about selling/finding a dream property for your clients, show them an example of a client who loved working with you. Convince clients you’re their go-to choice in your local area. Here are a few specific ways you can use social proof as a real estate agent. There’s no place better to use social proof than your website because that's where most of your clients will start searching for their new home. It’s the #1 spot to convince them you’re the person who will find their new home for them. People love numbers, and they’re easily impressed by them. If you have numbers that you’re proud of, they should be featured prominently within your website header. VERY IMPORTANT: Always remember that prospects care most about what you can do for them, not about how impressive you are — so make sure not to make this the only thing you feature in your header, and try to find ways to make your numbers relevant to your prospects' goals. Also, try to figure out the stats that favor you the most, and use those. i.e. — If your average selling price is low, but you sell a lot of homes, then focus on the total volume of homes. For best results, I recommend using 'Proven Accomplishments Social Proof' below your core message (ideally a single sentence of your core value proposition) and place them above or immediately below the fold. This is what's called a 'value stack' — it's a great way to present your impressive 'Proven Accomplishments Social Proof' in a way that supports your message or encourages prospects to take a desired action. There are some extremely important nuances that you need to be aware of when it comes to featuring reviews on your website. They make a world of difference. Pretty much every real estate agent has some reviews on their website. When you read reviews on a website.... do you implicitly trust them? Most of you are answering no.... as you should be! 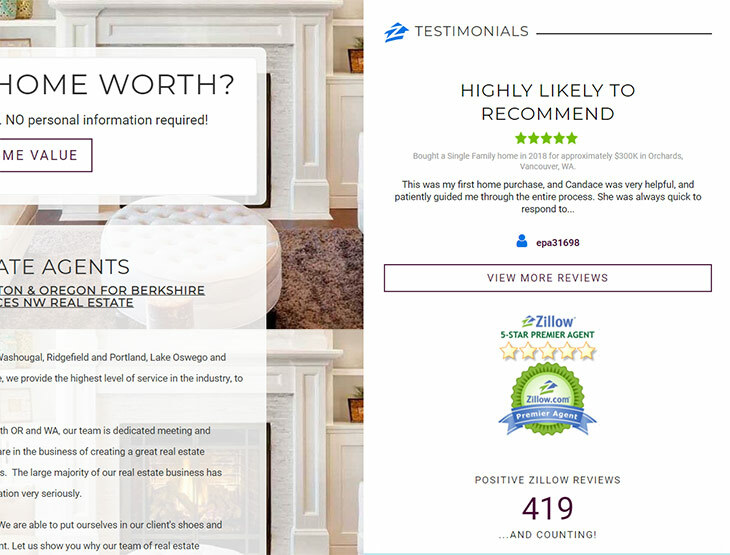 If you're featuring a client review that was submitted via Zillow, Google, Facebook, Yelp, etc... try to find a way to leverage that into the actual display of the testimonial, along with a link to one of those websites where they can view more of those reviews. 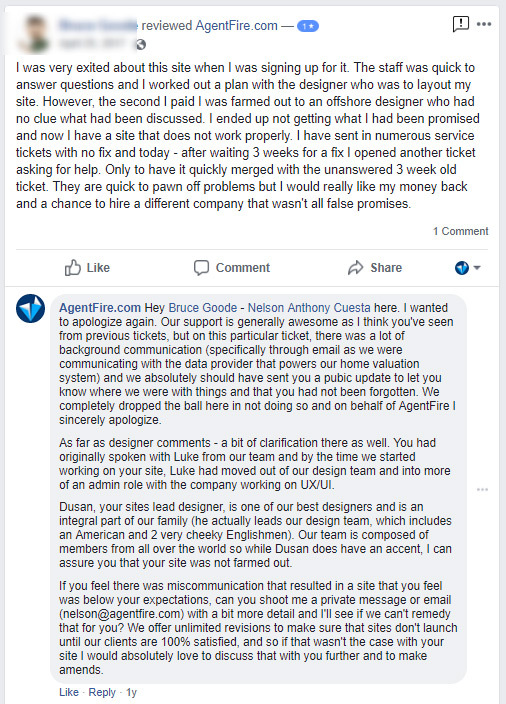 A great example of listing out client reviews in conjunction with the credible source where they were left! If you've accumulated a lot of reviews from a 'trusted' source (again, Zillow Reviews, Google, etc...) put them all on the same page. This way you're also showing your total number of reviews, as well as your aggregate score rating. The Eisenhauer Group has incredible Zillow reviews, so they feature their star rating & total # of reviews prominently with the testimonials on their website. Now I would be remiss if I didn't mention that our Spark Sites feature full integration with Zillow reviews — meaning that whenever a client leaves a review, they'll automatically syndicate to your website. If you don't have a Spark Site — you can also achieve this by getting a hold of a developer and hooking up to the Zillow Reviews API. Written testimonials are usually pretty boring. They fail to grab attention, and in many ways, it isn't 'proof' of anything. Add a photo and now you've at least put a face to the words. Happy family photo in front of the new home you just helped them find? Even better. Video of happy family in front of their home? Now we're cooking 🍳. Add photos or videos to your client reviews can literally bring them to life. One thing to mention about video reviews is don't overdo them. A couple of well-placed video reviews says more than enough! Lead magnets (buying guides, selling guides, etc.). Literally, any place where the client needs to take action and leave their contact data. Are you going above and beyond to market your seller's properties? Why not leverage social proof of your efforts here as well? Consider the example below. 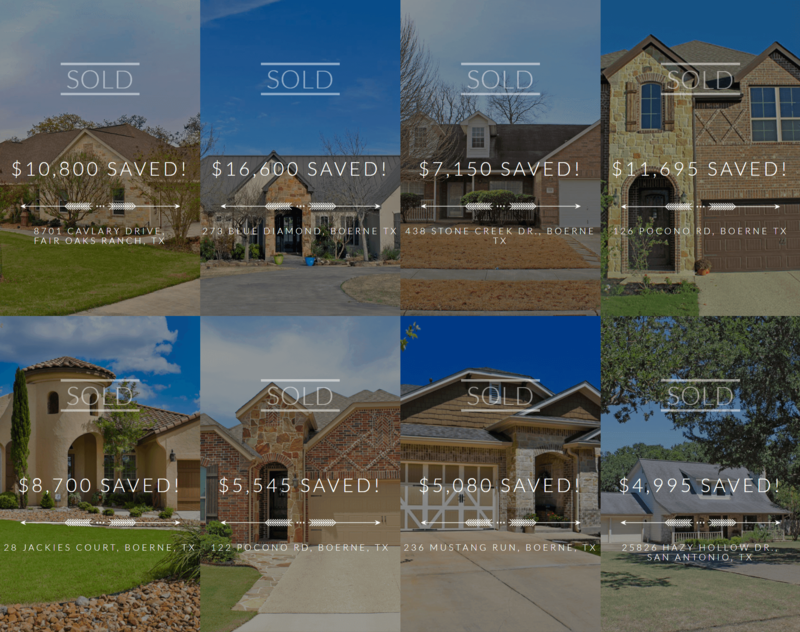 In addition to highlighting all of the different ways this team markets their seller properties, we built out 'photo-realistic' graphics. The 'Custom Website', 'Social Marketing', and 'Print Media' sections all feature actual examples of the exact marketing that this team uses, all super-imposed into high-quality stock photography. 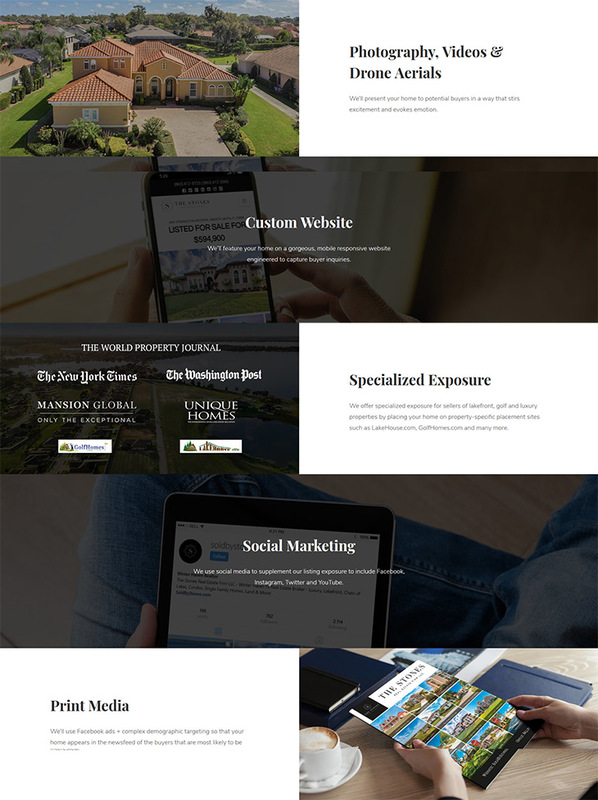 The 'SoldByStones' website combines actual assets from their marketing, with photo-realistic stock photography, to demonstrate to potential sellers everything that they can expect if they choose to list their home with SoldByStones. 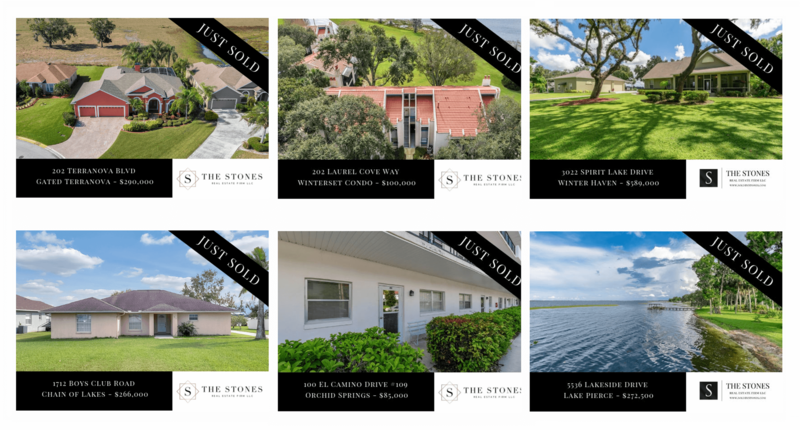 If you have seller-specific landing pages (like a "Why List With Me/Us" page) in addition to your 'Proven Accomplishments Social Proof' and 'Marketing Social Proof' (which we discussed above) — don't forget to showcase some of your actual sold properties! And remember how we talked about 'selective blindness'? If you can, don't just showcase the properties, but try to showcase stats, such as how quickly you were able to sell them, or how much 'above market' price you were able to secure. Your Facebook Business Page is the perfect place for you to share 'Hyperlocal & Authority Type' social proof content. In a nutshell, this would include any sort of content that provides value to prospective clients, while also simultaneously demonstrating hyperlocal real estate expertise. And you can actually feature your Facebook Business Page Feed into your website. In most cases, you'd probably want the help of a developer here. Or if you're using WordPress, there are plugins that make these possible (check out WordPress.org and search 'Facebook Feed). If you have a Spark Site, you can simply create a Facebook Feed CTA using our Engage CTA feature to have something like this appear on any page on your website. I think the best place to include your Facebook feed is in your blog posts (like in the above example). 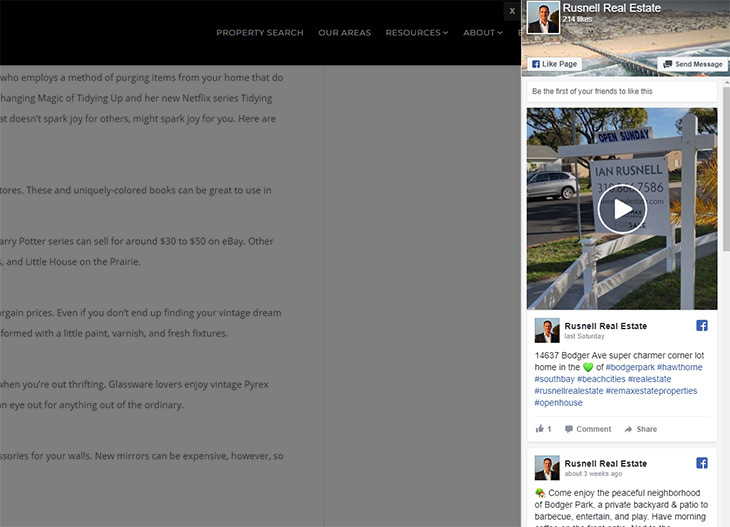 Or, if you tend to blog a lot about your hyperlocal areas, to feature them on your area pages. Much like the Facebook example above, if you're going hard with Instagram (which is inherently a GREAT tool for agents since Instagram is photo & video focused) — then you should incorporate your Instagram feed into your website as well. Again, you may need the help of a developer here, and there are WordPress plugins that can do this — or if you have a Spark Site, you can create an Instafeed CTA. Example of Instagram feed within one of our client's websites. I recommend placing your Instagram feed directly onto your homepage, about page, and possibly even as a call to action within your blog posts. Sometimes, negative reviews happen despite your best efforts to the contrary. Sometimes you're just having an off day, or if you're a broker or team leader, something one of your people do can result in a 1-star rating. Now the bad news it that 1-star revives are the first type of reviews that people look at. Heck, check our Facebook Reviews - as of this writing, we have 176 5-Star reviews, and 1 legitimate 1-star review (we have one other one that was left by some random person) - and it's the 1 star review that people look at first. Yikes! Don't 'fight' negative reviews. Instead, try to find truths in them - acknowledge where you went wrong - and demonstrate that you're committed to doing better! So, there is good news here - which is that negative reviews give you an opportunity to show what you're made of. If you receive a negative review - don't become combative, or try to get into an argument, regardless of whether the person who left it was justified or not or how unfair it may be. Instead - take responsibility! Show that you care! Acknowledge where you messed up and demonstrate your commitment to doing better. Also... hey... if you're considering signing up with, I would like to just quickly reiterate that over 99% of our reviews are 5-Star ⭐! (click here for Facebook Reviews, and here for Google Reviews). Collecting and creating social proof is only part of the equation in generating more results with your online efforts. Strategic implementation and deployment of social proof is the other part. Make sure to collect client reviews after every transaction. 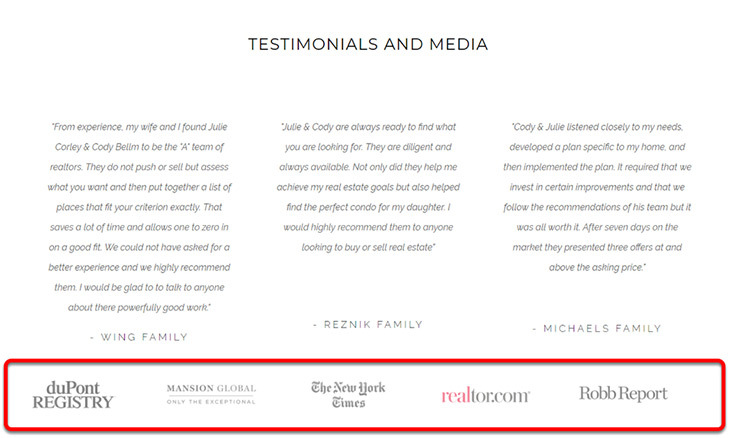 Have your clients leave you reviews in trusted sources (such as Zillow, Facebook, Google & Yelp... ideally all four!) — and then incorporate those reviews into your website, especially in areas where you're asking the prospect to perform a desired action (download a guide, contact you, etc). If you have proven accomplishments, use them to add credibility and create confidence around your core message, or around a desired action that you want the prospect to perform. I hope you've enjoyed this article.. just spent an entire Saturday churning it out for you all. 😊 If you enjoyed reading it, have any questions or comments, or just want to say hello, please do so in the comments below! !